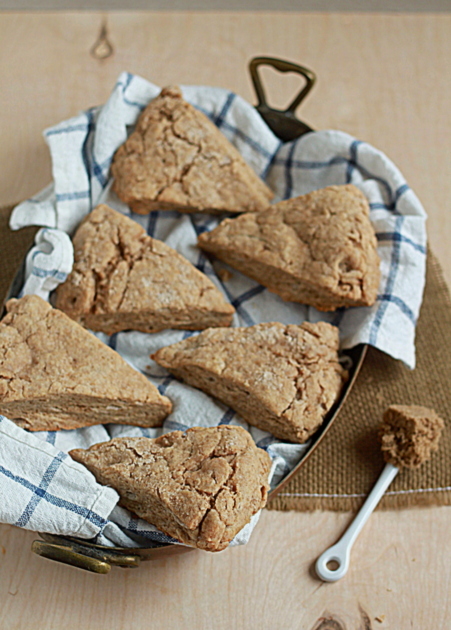 With warm cinnamon and rich brown sugar, these tender, flaky scones are simply sublime. And I’d say that pretty much nails it, and even though “SOOOO” and “cinnamony” aren’t words, I understand what I meant, and I’m pretty sure you must, too. I’ve been thinking about the recipe ever since, and I could not wait to make them again and share them here. I. Love. These scones. And I really love homemade scones, but these scones? Super extra sublime. 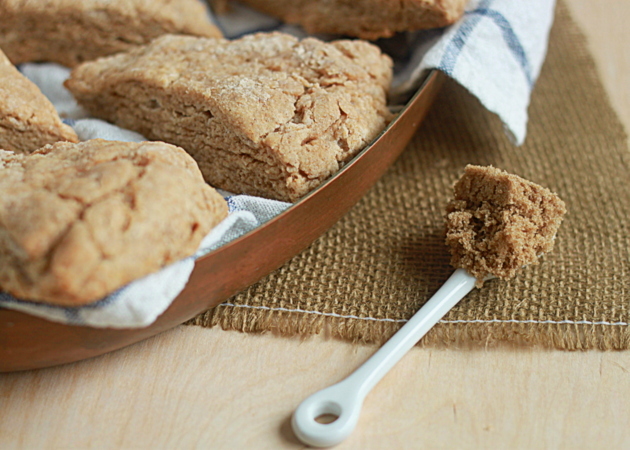 The cinnamon imparts its signature sweet warmth while the brown sugar adds such a divine rich note – and also, on occasion, creates these glorious crispy bits along the bottom of the scones that are particularly heavenly. They’re super tender, flaky, and … just … aaah. Especially with a piping-hot cup of coffee. I’m in love with a scone. Please send help. Whisk together the flour, baking powder, salt, brown sugar, and cinnamon. You may have a few brown sugar lumps; that’s fine. Work in the butter with a pastry blender until the mixture resembles coarse crumbs. In a separate bowl, whisk together the egg, heavy cream, and vanilla. Make a well in the dry ingredients and pour the wet ingredients in. With a wooden spoon, stir just until a dough forms. Turn dough onto a floured surface and form into a disc about 1-inch tall. Cut into 8 wedges. Bake on an ungreased cookie sheet (a cookie sheet lined with a silpat is great, too) at 350 degrees for about 12 – 14 minutes until the scones begin to brown on the bottom. Adapted from Food Network. 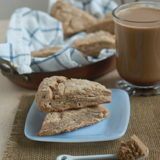 I use Alton Brown’s recipe as a jumping-off point for nearly all my scones recipes. It’s fabulous. These sound super yummy. I love cinnamon…like really love it. Im definitely trying these out this weekend! PS: I think its just fine to be in love with a scone! Beautiful scones! I can’t wait to try this recipe. Can these be made without a pastry blender? Yes, absolutely! Before I had a pastry blender I actually liked, I would start out with two butter knives to get the butter going, then just use my fingers. 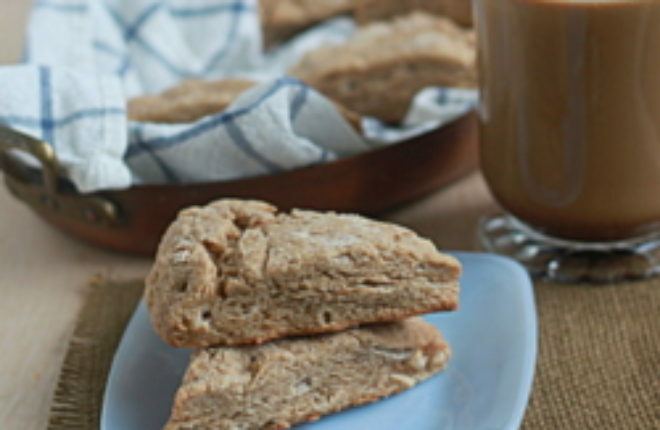 Oh my… there really is nothing like homemade scones, and these look delicious. We’ve just gotten a cold front here, and they sound perfect for breakfast tomorrow morning! LOL You didn’t like last winter? Mebbe this winter is better for you? Yeah…uh, no. I need one of these scones to start my day!!! With a HUGE cup of coffee as well. These sound amazing! These sound amazing. So warming and delicious! Definitely trying soon! More justification! I love it. 🙂 Thanks! These scones look amazing. Do they taste at all like the Pop-Tarts (only better of course)? If they do, that’s awesome because that is my favorite Pop-Tart flavor. You are my new hero. I’ve never made anything so divine in my life. Please will you take me in as a disciple?? I made these recently and they are by far the BEST scones I’ve ever had. My brother, who doesn’t like sweet breakfast food, ate three. I had to make a second batch. Amazing. Just made these! They are to die for! Thanks so much. Eehh~ they turned out ok… I don’t know what I did wrong. They weren’t all that sweet, and they cooked incredibly slow. They weren’t bad though! I’ll probably try again. I would advise strongly against using substitutes in this recipe!!! I used a heavy cream substitute and I’m not sure it worked properly. Good luck! Just made these over the weekend at 4000 miles above sea level! 😀 Had to increase the baking time and substitute evaporated milk, but they still turned out great. How did you get yours to rise so tall? Mine kind of look like they smooshed out the side. Thanks for the great instructions! I just made your scones, beautiful, light, fluffy and they make the house smell amazing. I made them to get my husband to get out of bed. Just made these and they are wonderful! I subbed in 1/2 cup of white whole wheat flour and they were still tender and flaky. I sprinkled a bit of cinnamon sugar on top right before baking and brewed a pot of tea for an afternoon treat. Thanks for the recipe! The best scones I’ve ever made! Buttery, creamy, flavorful, and oh-so-addicting. You won’t be sorry if you give these a try! Scone love. The purest love there is. Surefire recipe with a few exceptions. Having never made scones before, it wold be helpful to mention to separate the wedges – may seem obvious to the experienced scone baker but I left them just an eighth of an inch apart and they were still doughy on the sides. Also think a hotter oven: 400 instead of 350 and 16-20 minutes more accurate. At least thats what my experience was. But eventually they were baked through and tasted heavenly! I currently do not have any heavy cream… however I’d like to make for a work treat in the a.m.
Can I just use milk? Or would it work to use some milk, some greek yogurt? 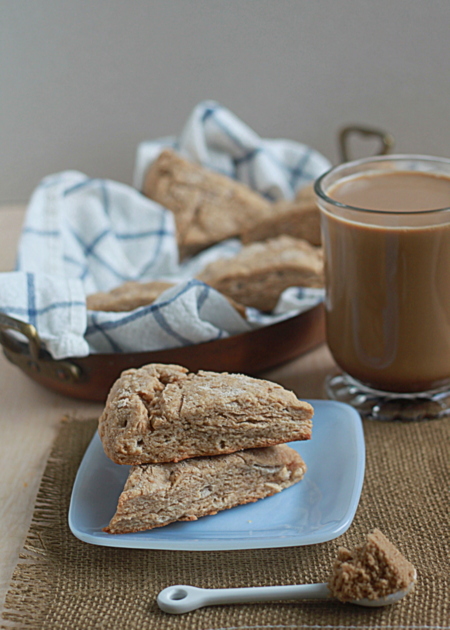 Love scones… these sound divine! Promised a special treat tomorrow and these would be perfect! Hi Amanda, I’m afraid I have no suggestion other than the heavy cream! I know there are scone recipes out there that do use yogurt, but I haven’t tried it with this recipe. Sorry I am not more help. Ummmmm. Not sure what I’m doing wrong. Had to make this twice because I thought I made a mistake the first time. Buuuuuut I didn’t. The batter is too wet. I had to add almost another cup of flour each time so I didn’t have club hands! But by doing so I over worked the flour and they weren’t as light as a scone should be? Hmmmmm? Not sure what is going on in my kitchen. Hey! I just made these tonight and they were perfect. My partner even ate two, and he never eats bread products! Thank you. Will be using this recipe again. OH – I also just used half & half instead of heavy cream because that is what I had in my fridge. No issues there. I made this recipe exactly as specified and the dough was a soupy mess and I couldn’t even form it into anything! How did it work for everyone else?? I would have had to add a ton more flour to even get the dough to come together. Thanks Vanessa, I’m so glad you liked them! 🙂 Enjoy Spain! The texture and these scones was great, and the flavor was almost perfect. It was a bit too salty for my taste (even used unsalted butter). I will cut the salt by a quarter tsp next time. Also, for those whose dough was too wet/sticky: I had to put the dough in the freezer for a bit before shaping and cutting. I think my issue was that I don’t have any way to cut in the cold butter quickly, so by the time it’s worked in enough it has melted. (I put the stick of butter in the freezer and then grated it with a cheese grater to get smaller workable bits.) Had to bake them a bit longer than the recipe called for, but they turned out fluffy and soft! How many scones does this recipe make? I made these this morning with a few updates, and they are AMAZING! I used 1/2 cup blueberry powder from Karen’s Naturals in place of 1/2 cup flour. I used pastry flour instead of regular. I had to bake them longer, about another 5 minutes. Not sure if it’s because of the substitution? I also didn’t know whether to bake them separated, and for the most part they were placed together on the pan. Either way, this is now a go-to recipe. Blueberry powder?! I’ve never heard of that! Totally intrigued. Oh myyyyy! Luscious, tender, and the right amount of cinnamon! I baked mine on a stone and it took about 4 minutes longer, but they turned out well and wonderful with our tea! Thank you! Just made these this afternoon & they are absolutely delish ! I make scones often & this is a really perfect recipe .They are very moist with just the right amount of sweetness . I mixed the batter in my food processor just till moist , after cutting I brushed heavy cream on top and sprinkle with just a bit more brown sugar & cinnamon . I just love them ! This looks wonderful! I’m going to try it tonight. You did leave out the butter in the recipe. That…or I’m going crazy. Either one is a viable option 😆. I’m going to cut the butter in with the dry ingredients with a pastry cutter. Do you think that is a better option than melting the butter and adding it to the wet ingredients? I’m just going off of how I make biscuits, honestly. Oh my! A friend and I made these scones today, and wow they turned out great. The recipe is easy to follow, with ingredients you probably already have in your kitchen.